The 45-year-old was walking off Boston's Orange Line train at Massachusetts Avenue around 5.30 pm on Friday when she lost her footing and plunged down the gap, giving her a deep cut that went right down to the bone. 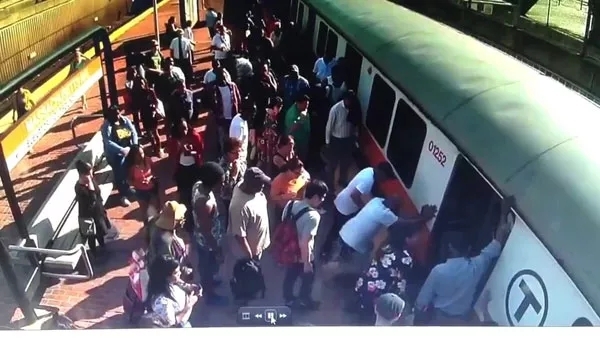 Her fellow passengers helped push the train to the side and free her, but even as she thanked them, shaking and weeping from the pain, she begged them not to call an ambulance because it cost too much. The woman's heartbreaking pleas have reignited the debate around healthcare in the US, with many branding it 'barbaric' that someone should be forced to choose between life and debt. 'It is absolutely disgraceful that someone has to worry about the cost of an ambulance in a situation like that. My thoughts are with her,' said Twitter user Yalina. 'It's barbaric, outdated, and just unrealistic,' another tweet read. Many Americans said they are angry with the current state of healthcare, which they say is confusing, unfair and overly expensive. Americans spend more money on healthcare than any other population, and healthcare spending rocketed $900 billion between 1996 and 2013. By 2013, total healthcare spending hit $2.1 trillion, according to the study published in the Journal of the American Medical Association. The researchers say that figure has now likely soared to more than $3.2 trillion, which equates to 18 percent of the country's economy. But while spending increased, America's life expectancy has remained sluggish - with an average of 79 years old, compared to the global average of 83 years old. The US is the only country in which wealth has been linked to life expectancy with a study finding that the richest one percent were found to live an average of 15 years longer than the poorest one percent. The tweet that started the debate came from Boston Globe reporter Maria Cramer who was on the platform when the woman got her leg trapped. The tweet has been shared and liked tens of thousands of times. Meanwhile, the victim who has not been named, was eventually taken to the Boston Medical Center, where her thigh was found to have a 'serious laceration, exposing the bone' that would need surgery. Boston EMS chief Jim Hooley said ambulance callouts generally costed up to $1,900 for people with pressing needs, like resuscitation.